We have a HUGE project on our hands and will need a MAHOOSIVE lift from you guys, if you are up for it? Our reputation is also at stake as we are “competing” to hit our target first and win cake …. 😉 Let me tell you the BIG story …. On Thursday I was contacted by a pound puller who we have worked with for many years. She knows we have no kennels at the moment but wondered if we would be able to help fundraise for a young dog. 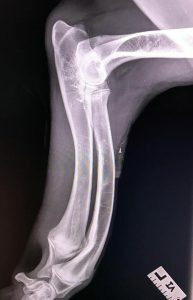 You see, this young dog was taken in from the pound, stray, not wanted, chipped but not registered, and then it was discovered that he needs quite significant surgery – very expensive surgery. He needs a LOT of delicate surgery on his legs as he was severely malnourished when born, and was discarded like a piece of rubbish …. 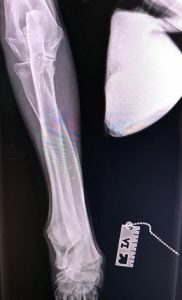 well, he is with a lovely rescue in Yorkshire who we have been speaking to – but they cannot take in any more “at risk dogs” because of the cost of this boy’s surgery looming over them so the situation basically is that they cannot take any more dogs from PTS situations until this lad has his surgery and on the road to recovery. They have had a bad run of cruciate and other operations with dogs recently and you all know how expensive those are so in effect, they are struggling. Could we help? Well as you know we are a sucker for a hard luck story, especially where a beautiful young pup is involved and so we said yes! In fact, the boy needs £13,000 raising and we have said we will go half …….. AND if we can get our half before they get their half, they will buy us cake! LOL! We don’t know if this boy is in pain – he has been like this since birth so he may just think that pain is “normal” and be getting on with it. I don’t like that idea SO we need to raise the money as quickly as we can to get him the surgery ASAP – he may be in pain but either way he can’t be comfortable OH and because of the deformity (I will share x rays later) he has to be lead walked, cannot run around, cannot mix with other dogs (he likes other dogs!) in case he gets injured playing and has to have lots of sniffing slow walks …. Can we do this for him? PLEASE???? 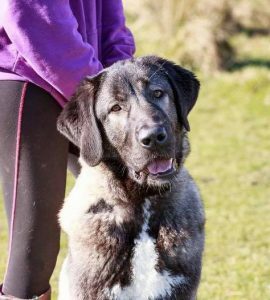 Storm is around 10 months old, friendly, loving, goofy BIG lad but he desperately needs surgery and if you look at the photos that will follow, you will see why. Are you up for supporting us please? We will run various auctions, offer prizes, beg for pennies and more besides … but we need to hit our target of £6,500 before the team at Moorview do! This is Team FFH pride at stake! Sadly we have been unable to find premises that are suitable for us. We thought we had found somewhere quite perfect but they didn’t have the space that we needed and there was work to be done, but never say never, eh? It’s sad though as I think we have the right attitude and spirit to make a difference to dogs in need. We built a good reputation, I believe, and we don’t want that to be sullied and we could only sleep easy at night knowing that our dogs were safe, secure, warm, dry and comfortable with good standards of care, so no compromise there I’m afraid so we shall see …. In the meantime we have been busy helping to promote dogs who are with other small rescues, just to see if we give them the benefit of a bigger, different audience, whether their luck might change and I know that our effort and energy has been proving fruitful in some cases at least. At least our network and social media platforms are being put to good use in the meantime – we spent a long time building them up. The other thing I just wanted to let you know about was money – I know people had sponsored kennels and donated to us over Christmas so I wanted to explain where that is being used so that everything is transparent. You will know this if you follow our Facebook page regularly as we tend to update there a lot – it’s easier than Twitter as message length isn’t restricted thus avoiding some of the shorthand that causes confusion on Twitter sometimes PLUS it is easier to answer any questions that follow – sometimes I miss stuff on Twitter and folk get cross with me …. Any old how we have been spending money every month on Malik and his medication, as well as on Chica and will continue to do so as she continues to improve with hydro, raw diet and on pain relief; we bought all Maxi’s food and paid for his vet check up, flea & worm and bills until he was adopted, Rocky needed vet bills covering and several behaviourist visits, 1:1, and you are aware we sadly spent a small fortune on Buster (almost £2,500) in the 48 hours before he died …. We have paid for behavioural support for Fraser as well as his day to day needs, as well as Logan and Poppy who have both had one to one behaviourist visits. Piglet has been to see a holistic vet to try and get her off those awful steroids, Humphrey needed a couple of one to one’s to help with his fear of other dogs, we paid the vet bill for Kendrick who was adopted last year but needed another cruciate op (£1200) and of course you know about Duchess and her SLO? We’ve just ordered 48 bags of food for the dogs up in Scotland and donated some funds to Operation Hope when they took on the DDB’s last month. So as you can see we have been busy still behind the scenes, and even as I sit here writing this today I can see photos pinging in from the one to one we arranged for Wolfie today – he has still not learned to leave the cows alone on the farm where he lives so today we sent some professional specialist help to support the family with their efforts – he’s very much loved but just needs these corners smoothing off. Finding Furever Homes NEEDS A NEW HOME! In order to carry on doing the work we do and helping dogs who need that little bit extra – dogs like Maximus, Frazer, Rocky – we need new premises and fast! We have been looking for quite some time now but the pawfect solution has evaded us …. can you help? He went into the vet on Tuesday for an xray on his back leg that he was carrying and just did not recover from it. He was vomiting and in distress which at first was thought “sometimes happens following anaesthetic” but he didn’t get better. Last night we transferred him to the emergency vets where they had him on a drip and pain relief; they did a full set of bloods and then went on to scan his abdomen and chest, finding nothing that they could pinpoint. Buster went home this morning but was suffering. 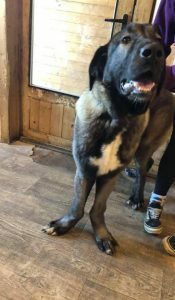 He was not eating, was not drinking, could not walk and his tummy was very painful and swollen – the emergency vet wondered about a gastric ulcer or other similar condition. I spoke to his Fabulous Foster Family at lunch time and we agreed we should not leave him to suffer further, it was time for him to go and find his beloved Dad. He was in pain, no quality to his life and his time had come. 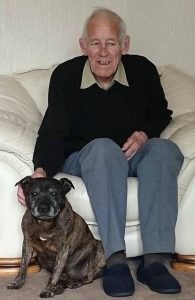 I want to say a huge thank you to the amazing staff at Dignipets who came to Buster’s home and helped him leave for the Bridge with dignity, surrounded by the people who loved him so very much. They have taken Buster away today so that his ashes can be scattered with his Dad’s. I want to also say a huge thank you to Buster’s Fabulous Foster Fambly, who, despite all their own sadness and loss this last year have always made sure that Buster was well cared for, happy and felt very loved. They lost their Dad too in the summer and shared in Buster’s sadness at his passing and you know that Mum is also very poorly too, but they made sure Buster was OK. Thank you also to the lovely couple who had offered Buster a most marvellous home for the next chapter of his life – I’m sorry he never got to come and bimble around with your girl in that lovely garden you have. Today was meant to be a day of happy celebration and I have spent most of it in tears; Buster was not meant to go today. Buster was supposed to live Furever. The one thing that has given me some peace of mind this evening though is that I KNOW we did everything we possibly could for him. Thanks to YOUR support FFH have paid all of Buster’s vet and medical bills since May 2017 and thanks to YOUR support, last night we were able to say to the emergency vets – “Please do whatever you can, whatever the cost, if there is a chance.” That has given me peace of mind today as I know not every rescue would have done that for him. Some would not even have helped him into a home and paid his bills as we have so although today has turned out to be a very, very sad day, I know at the heart of it that FFH has done what it was set up to do and we tried. We tried our hardest. We never let him down, right up to the end where he went on his final journey from the place he called home. Ladies and gentlemen, please will you join me tonight in lighting a candle to light Buster’s way to the Bridge to help him spot his Dad and run to him again? Please pop a photo below and let’s make a long, long trail of candlelight for this boy. Fly high Buster Bear, fly free, with the sun on your back and a gentle breeze in your face, fly high sweetheart, sleep easy, safe with your beloved Dad again, very much loved and very much missed by your Fambly left behind. Mr Cripwell – your boy is on his way to find you – whistle him, he’ll hear. As you are all aware we try our very best for all our dogs and spend a lot of time, effort and money helping them into Furever Homes. We have a thorough home check and vetting process, we encourage time, opportunity and chance to get to know the dog properly before taking them home, and as a result we find some totally fantastic homes for our dogs – thank you! When we receive an application from someone who tells us they are “very flexible and very committed” and they go on to list all the things they will do to help a dog settle, we get encouraged, and we do the home check, we arrange a meeting, we pay for specialist behavioural support if the dog has perhaps been in kennels a long time or has specific needs and we do all of that willingly and with total enthusiasm and commitment – after all, this is to be a Furever Home and the dog’s wellbeing is paramount. We even do follow up checks and again pay for 1:1 advice and training, again in the belief that we are doing our bit to help a dog have a great life – to be free from kennels, to be happy, safe and loved Furever by a family of their own. And we fundraise tirelessly to cover all costs in this approach – believing we are doing our very best and taking time and slow and steady and step by step so that the dog is known and understood by the new family and that they have our full support. We do ALL of that and more besides so that a dog doesn’t get returned to kennels as that just messes with their minds. They are already with us because they have been “abandoned” (for whatever reason) by people who they were attached to/lived with and we know that every time they are rejected it adds a layer of anxiety onto what was already there. We do what we do for the dogs to save them having to experience that rejection and returning to kennels – they have no idea what they have done wrong, and in fairness, in most cases they haven’t – but all they know is this is different again, and they are confused and a level of anxiety adds to what was already there before. We believe in our process. We are committed to our dogs, We will fund whatever support a family need to give that dog the home it deserves and the chance it needs and we will work tirelessly to make it happen – for that dog. Every time. Sometimes we insist on several visits, several “getting to know you sessions”, we even pay for one to one training and support with the Maybe Family whilst the dog is still with us in kennels. We did all of this with Wolfie. You will have seen his photo just last week when we did another 1:1 in the home with him to check all was well. Wagging tail and happy dog. Wolfie is back in kennels this morning and looking for his Furever Home. Again. He was “too much for them to take on”. I am posting this to really drive home the message that WE do what WE do for the dogs. The dogs do NOT deserve to be bounced around. Please only apply for a dog if you totally and utterly commit to it – otherwise it is not fair on the dog. Take all the time you need to meet it, assess it, decide if it is for you. Have trial visits, take it out for the day, take it home with you. Take full advantage of all the behavioural support and training that is offered, free of charge and do that over a 4-6 week process as we did here. But then commit to it? And unless something catastrophic happens, keep the promise that you made. Wolfie is back in kennels through no fault of his own. We shall start again. Jade is 16 years old. Sadly her owner passed away and Jade was left with nobody. Jade has cataracts, is partially deaf and has a bladder tumour, but she is a friendly, loving, happy, active little girl who deserves a chance. Dogs like Buster who has enjoyed the most fabulous year in Furever Foster with his lovely family taking care of him and his day to day needs, and we pick up his monthly medication bill at their vets – win:win. Dogs like Polly who are left crippled and unable to walk at age just 4 years because when she was a puppy a problem with her knees was not attended to and so over the years the bones have bowed, she now has spinal problems and her nails are a very odd shape as she drags her back legs behind her, or bunny hops sometimes to get around. Some days are better than others but she is not in pain and she has such a lovely temperament and just wants to be loved – what are we supposed to do? Polly is going to start on a course of hydrotherapy to see if we can build back up muscle mass and the vet will then look at what is best to do for her from then on. These are the dogs that we will support for life. Someone takes them into their home and cares for them as if they were their own and FFH covers vet bills and any special needs – that way the dogs is loved and happy and secure in a home environment and getting the help they need from us too. At the moment we currently pay out over £250 per month in Furever Foster vet bills and we would be grateful for your help – just a small amount can go a long way with our oldies and poorlies – can you help at all? You can donate on line or text JADE16 £amount to 70070 to donate to Furever Foster Homes and make a difference today. The link to our Just Giving page where you can donate is here ….. This year we have a new venue for our Rescue Ramble and Fun Dog Show – on Sunday 25th June we are excited to be at Moore RUFC which is in the lovely village of Moore, near Warrington. The address is Gentlemen of Moore RUFC, Moss Ln, Moore, Warrington WA4 6UU and it is really easy to find from the M56 motorway or through Runcorn or Warrington. Here is our challenge to you! Between 7-9th April 2017 we are asking our volunteers to step out and help us raise cash for the dogs in rescue. You can do this wherever you live in the country, and create your own team to take part should you so wish? We want to cover 2017 miles between us and raise £2017 to help dogs in need this Spring. We can provide you with a poster to advertise your event and a sponsorship form to get your friends, family and workmates to sponsor you. And so much has happened since I last updated here – so many dogs have come and gone and sadly some came and are still here …. Some we lost to illness and others have gone to Fabulous FUREVER Homes and we are so proud of their achievements. Our fabulous group of volunteers continue to work hard to raise funds and awareness and to help find those homes, and we now have over 420 dogs who have found their Furevers through that network – thank you! First time in a long time. I’m generally quite good at holding it in, but a little boy whose eyes looked so lost and scared and frightened was cowering every time the other dogs barked, every time a loud noise happened. Got me thinking. Why do I put myself through this? I don’t have to! I can just go home and be with my family and shop for Christmas and be totally and utterly bored and unchallenged ………….